I wrote this paper in my first semester of graduate school, while I was taking a course on nursing theory. 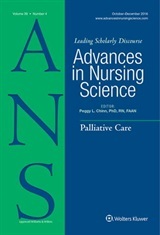 As we began to dive into the literature, I was shocked to learn that there is debate about whether caring can be considered a central concept of nursing. In my own practice, and in observing the practice of others, I had come to believe that a nurse’s ability to care is what creates the difference between another strange face at the bedside and the caring individual who helps a patient through one of the hardest, scariest parts of their life. As I investigated more, I found arguments that caring was a gendered, devalued concept that would degrade the professional nature nursing was striving to give itself. That many professions also lay claim to caring, so it was illogical to think that nursing could make caring its central focus. That caring explained the art of nursing, but what about the science of nursing? These points seemed valid at first, but as I read more and thoughtfully considered my practice, I was still sure that caring is a trait that all humans have to some degree, but it is professionalized in nursing. So then I had to answer the tough questions. If caring is so central to nursing, why can’t we agree on a single definition for the concept? How can other professions also profess to be caring? Does embracing the complexity and emotional nature of caring mean devaluing the scientific practice also essential to nursing? In a healthcare environment where human science is increasing in importance, I think I can answer all of these questions in a positive light. The reason there is no single, simple definition for caring is because nursing is not a simple profession. Other professions can claim to be caring, but just as we draw on medical knowledge, other professions can draw on our knowledge of caring. Lastly, being a caring nurse does not mean being an unscientific one. In fact, I would argue that without a strong understanding of the disease process of your patient, you can’t be a truly caring nurse. I hope that this article inspires others to consider what role caring plays in their own nursing practice. I hope the discussion and debate continues. Lastly, I hope that after a stressful day, this article can help remind nurses why we have chosen a worthy, meaningful profession. Now that I have begun PhD study, I have furthered my investigation of the concept of caring by looking at what caring means in the context of the technological environment of the ICU. Can a nurse deeply involved in the technical care of a patient still be caring? That’s the next question for me to consider!